Apple continues to drive forward in its attempt to teach people how to develop with Swift with a massive European expansion of its Everyone Can Code scheme. Apple has been putting a huge amount of effort into evangelizing its open source Swift development language. It has announced a range of initiatives with which to achieve this, ranging from child-focused coding lessons in stores to provision of a wide swathe of educational and other learning materials. Downloaded over 1.4 million times, Swift Playground remains an easy and accessible way to learn some of the principles of coding with Swift. The new extension of its coding education means 70 colleges and universities in Europe are adopting Apple's App Development with Swift curriculum, a one-year curriculum that the company launched in May 2017 as part of its Everyone Can Code program. In the U.K., you can now study these course at 15 well-known locations, including Highgate School in London, Plymouth University, Aberystwyth University, University of Liverpool, and Birkbeck University of London. There are courses now available at colleges and universities across Europe, including in Germany, France, Italy, Spain, the Netherlands, Sweden, Denmark, Norway, Austria, Belgium, the Czech Republic, Ireland, Luxembourg, Poland, and (beautiful) Portugal. Apple continues to face criticism for the way it has handled its European commitments to taxation. As a result, it is working hard to get the message across as to how much it already contributes to the markets it does so much business in. In the U.K. there are 255,000 app economy jobs attributable to the iOS and App Store ecosystem, I have learned. Empowerment through recruitment, opportunity provision, and education in new skills designed to help people take advantage of those opportunities is one form of commitment, I guess. 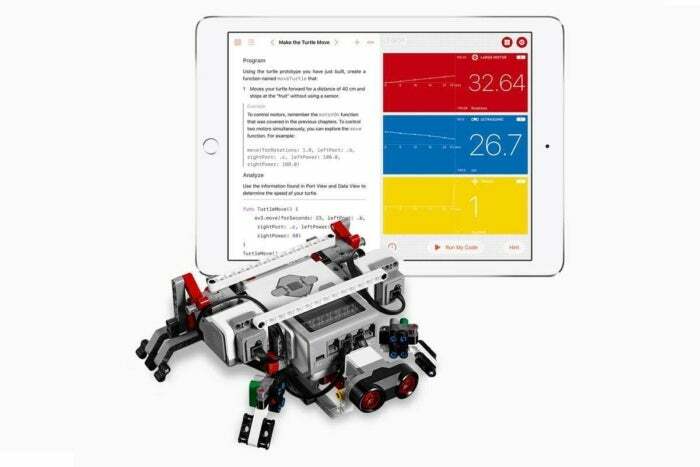 “Coding is an essential skill for today’s workforce, and through Everyone Can Code, we’re giving people around the world the power to learn, write and teach coding,” said Apple CEO Tim Cook. Some have argued that Apple’s focus on teaching coding should also be matched by an equal focus on the liberal arts. The problem with that argument is that the company also offers plenty of free resources to help learn new creative skills inside its stores — just take a look at the Today at Apple listings for your local outlet. All the same, the focus on coding is an answer to a very real need. Code.org claims there are over 486,686 open computing jobs in the U.S., but only 42,969 computer science students graduated into the workforce last year, meaning vacancies exist for the gifted. That’s an opportunity for adults and children, who can at least try to find out if they have the talent to build software. Swift is also open source, meaning you can use it to build Android apps. It is also important to consider that as technology becomes wrapped around ever more areas of daily life, demand for coding skills is likely to increase exponentially. The other side of that coin is that establishing at least some familiarity with how coding works may become an essential survival skill to manage our way through an increasingly connected, and also oddly disconnected, age. “At Harlow College, we recognize that learning to code will help students prepare for a technological future. It develops their approach to problem solving, logic and reasoning, as well as reinforcing key mathematical skills,” said Karen Spencer, principal of Harlow College. In related news, Apple recently announced plans to create 20,000 jobs, create a new tech support campus at an undisclosed U.S. location, engage in stock buyback, and offer employee bonus schemes on the back of the repatriated mountain of cash it has gathered in its international markets across the last few years. You can download The Swift Programming Language from the iBooks Store free.